Hampton Grammar School was a private, fee paying school but little information is available so the date of its opening is not known. An article published in the Express and Times Gazette in the 1960’s states that the school was opened in the early 1890’s by Daniel Christmas Lloyd. He had been appointed to the pastorate of Maesyronnen and Glasbury in 1891 and shortly after taking up this post started a school at Hampton House. However, a school had been in existence many years before, founded by a Mr W. Vaughan who was in turn succeeded by a Mr Phillips. An entry in the Felindre School log book dated 19th January, 1883, refers to Edwin Thomas leaving that school for Hampton Grammar School. The school had apparently been very successful but had been closed for some years prior to the arrival of Mr Lloyd. The school, under Mr Lloyd, proved so successful that he resigned his pastorate to give his full time to the school – which he did until his death in 1929. Classics, Mathematics, Civil Service, Shorthand, Typewriting, Commercial Tuition, Music. Pupils highly successful at London, Oxford, Cambridge and Wales Universities. Also in public exams. For prospectus apply: Rev. D.C. Lloyd. Summer term commenced on Tuesday, 28th April, 1914. 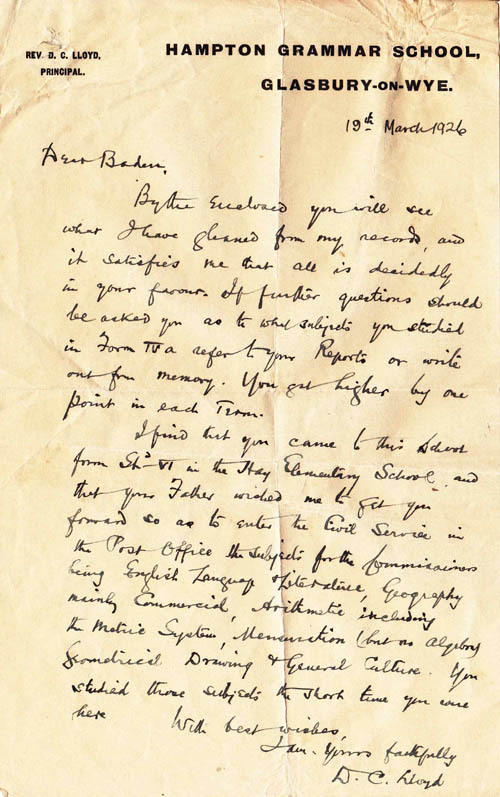 The receipt of these letters arose through Mr Williams interest in the history of Glasbury and directly due to his perusal of the web-site, where-on he made contact via the email address provided. 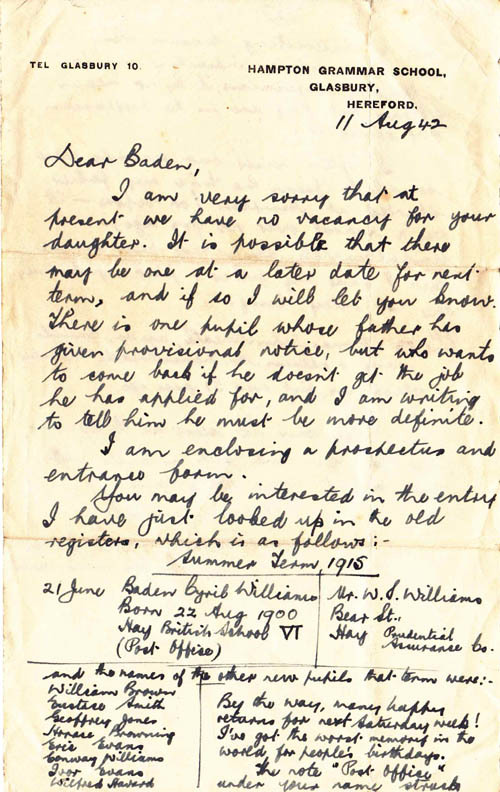 This earlier letter of 1926 by Daniel Christmas Lloyd appears to be in reply to a request for some form of reference / information by Baden Williams ( Roderick's father ) and it further seems that they knew each other at a familiar level due to the use of the forename Baden. It also tells us that Baden attended the school for a short time only. 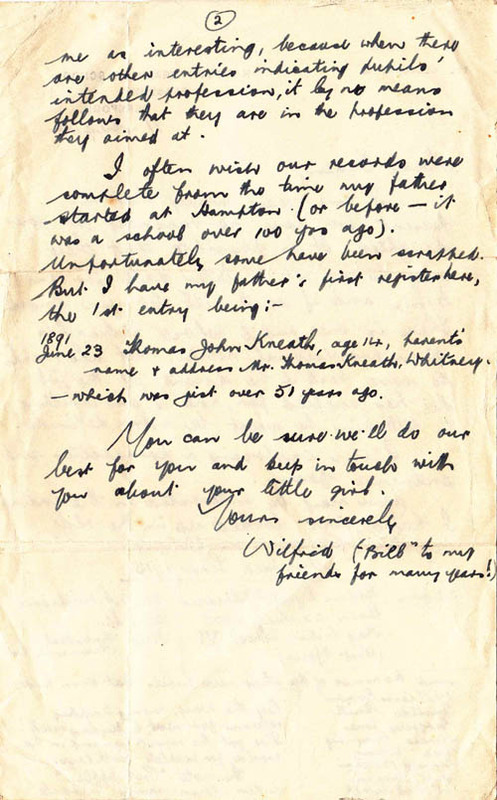 The second letter below, of two pages and written in 1942 by Wilfred Lloyd ( the son of D. C. Lloyd ) is again addressed to Roderick's father Baden. It tells us that the school now has a telephone number and informs us that Baden was aged 15 whilst at Hampton Grammar in 1915. It also names several of Baden's peers at the time. "1891 June23 Thomas John Kneath, age 14, parent's name and and address Thomas Kneath, Whitney"
"The present pastor of the two churches, the Rev. D. C. Lloyd, on his settlement in 1891, immediately opened a Grammar School at his residence, Hampton House"
This from "Brecon and Radnorshire Congregationalism" - Commemoration Volume - Edited by T Gwyn and Prof Joseph Jones 1904 - p101. 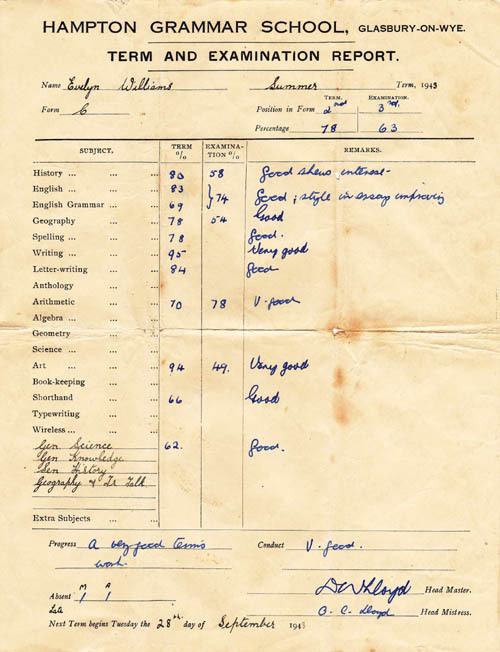 My married name is Mrs Evelyn Howland and I will try to give you a recollection of my time at Hampton Grammar School , then being a Miss Williams from Hay post office. 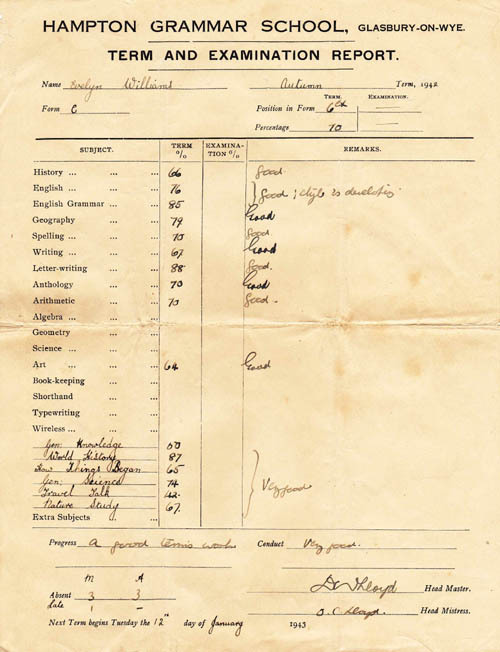 Anyone who has seen the Glasbury Schools Web Site may remember the letter written by Baden Williams in 1942, asking about a place at the school for his daughter , well that was me. Most of the pupils used to cycle to school, many up to around 10 miles in all weathers, we were all pretty tough in those days . These are the children I remember from then; Ann and Mary Evans from Clifford, Dulcie Bampfield from Penymaes Kenneth Powell from the Holly Bush Inn, also two boys from Hay we used to meet up with on the way, Harold Williams and Hubert Williams. The roads were very quiet then due to the petrol rationing, and not many people owned a vehicle anyway. Perhaps the odd delivery van would pass us . One thing that stands out in my mind of those journeys, was the number of birds in the hedgerows , mainly Yellow Hammers , they are the colour of canaries. Anyway forward to the school itself. There was a large room in which we had lessons, sometimes running two lessons at once. The one half reading one subject and the other getting instruction on the board, mostly by Mrs Olive Lloyd, of geometry etc, which used to annoy me as the subject always looked much more interesting than what I was reading at the time, these interesting lessons seemed to be only taught to boys . There was a small room in the house in which there was a couple of typewriters , for pupils to learn to type and do shorthand, which I did for a while. Out the back of the school there was a mobile classroom in which Mr Bill Lloyd always seemed to teach different subjects. He was a lovely man, nothing used to upset him , the boys used to play him up sometimes , like just leaving the door ajar with boots or something on top of the door balanced enough that on opening the door they would fall on one’s head, but Bill, as we ourselves called him was wise to their little games, and would kick the door as he came in, walking to his desk saying nothing . Another trick which rarely failed was to quietly get him talking about when he was working away from home as a young man. It was far more interesting to the boys than what he was trying to teach them. Mrs Lloyd was a person who we all would try to keep on the right side of. I think she was the boss there. If anyone played up she would dole out the punishment. Thinking of punishment, we were given a right old dressing down by her a couple of times. The whole class would be in it, if anything happened we would always, it seemed, work together so she had to punish us all . Twice while I was there we got in to trouble. The other time we worked in unison was when someone came into school one morning and had heard that a plane had landed in a field by the river near Llowes. So it was arranged in whispers, that if we all went at dinner time on our bikes together, we would be able to get there and back in our dinner hour to have a look. To start with, we were not supposed to go out on the road at dinner times with our bicycles , but with great stealth we got under way. On arrival at the site it was guarded by the military and we were not allowed to go anywhere near it. It was only a small plane but to this day I haven’t a clue whether it was a German plane or one of ours. The big mistake we all made, was that time was forgotten and we arrived back at school late. Oh boy! that really got us into big trouble with Mr and Mrs Lloyd. All sorts of restrictions imposed and we ended up weeding the garden after school, so making us late back home and parents asking for answers . We could have been later weeding that garden but I remember getting a nose bleed , which I seemed to suffer with in those days and Bill took pity on me (or fright), but then said everyone could go home. The more I write this, the more little bits come back to me. We used to play cricket in a field behind Morgan’s shop (1*) if the weather was fine, with Mr Lloyd. That field is now full of houses and has a road running through it. Going back to the schoolroom in the house, we had a large fire lit when it was cold where we used to sit around to have our sandwiches and drinks at dinner times. The fire surround was scarred with lots of initials and dates that had been burnt into it by lots of children before us with the hot poker that was in the fire fender. The desks had a mass of dates and initials all over them too. It would make interesting reading today. Roger Williams who came from Talgarth, who worked in the psychiatric hospital there, and on his retirement wrote two books on Talgarth as he knew it and its history mentioning that he went to Hampton Grammar School. Jenkin Powell . His sons now run the Anchorage caravan site in Bronllys. Beris Jones from Llyswen, and two other boys who’s surnames were also Jones. Pat ------------(2*) his surname has gone from my mind, was from Fynnongynydd. Another boy from Glasbury, whose name was John Davies, joined the Navy on call up. He lost his life whilst trying to save his mates from drowning. The full story I don’t know, but this was typical of him. We girls always fancied him, as he was always kind and had a gentle personality. I enjoyed my time at Hampton School . It was rather an unsettling time for us all. Whether I gained a good education is still debateable, but I hope this gives an insight into my time there. (2*) This was Pat Griffiths, later to marry Marion Jones. The teachers at Hampton Grammar School in my day were husband and wife. Most pupils were those who had failed the 11+ exam and were therefore denied entrance to secondary education at the grammar schools in Llandrindod Wells or Brecon. The pupils came from villages within 10 miles of Glasbury. They were mostly “weekly boarders” i.e. staying with villagers from Sunday to Friday night. My mother accommodated the daughter of an acquaintance who was a forestry worker. When food rationing started in the 1940s, it caused some confusion about food rations i.e. how much of the “boarder’s’” butter, cheese meat had to be taken from their home to provide meals while boarding. There was relief all round when my father shot a rabbit or my mother decided that one of the hens had stopped laying and was killed, feathered and cooked for a non-rationed meal. There were also several people in the village who kept a pig and those neighbours who contributed food for the pig had a share of the pork when it was killed. Articles found in local newspapers. Anecdotal evidence from former residents of the village.